Steve Jobs announced the new iPhone 4 only eight days ago during his WWDC 2010 keynote, and it is now ready for pre-order. Well, at least one of them is. The black iPhone 4 is available to pre-order today with free shipping or in-store pickup on Thursday, June 24. The white iPhone 4, however, is “currently unavailable for pre-order or in-store pickup,” with no word on when it might be ready. 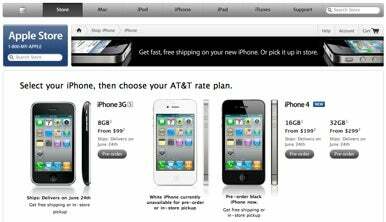 The 8GB iPhone 3GS, which will replace the iPhone 3G at the lower $99 price point, is also available to pre-order today with free shipping or in-store pickup. it arrives alongside the iPhone 4 on June 24. Apple released the iPhone 4 for pre-orders sometime in the early hours of Tuesday, June 15. The company’s online store has apparently been fighting heavy traffic, however, as it has been up and down over the past few hours. Scattered reports indicate the checkout process failing during one step or another. Apple’s store is intermittently available as of this writing, so if you’re itching to pre-order your phone as soon as possible this morning, you may be in for a bumpy ride.